Garadice members John McCartin, Pádraig McGovern, Dave Sheridan and Eleanor Shanley. 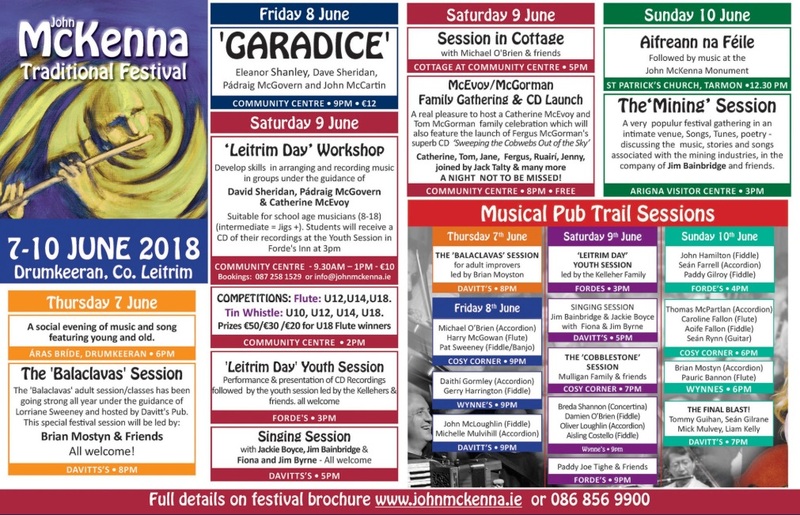 This year’s John McKenna festival continues in Drumkeeran until Sunday. There is an extensive programme in place with the finest of traditional music at the core of all events. The John McKenna Festival began yesterday, Thursday, in Aras Bríde with an informal early evening of music especially for the residents of Aras Bride and continues until Sunday, June 10. The concert commences at 9pm and admission is €12. Saturday’s activities begins with the ‘Leitrim Day’ performance and recording workshops. A great success during the 2017 festival. This workshop will afford young musicians an opportunity to learn and develop skills in arranging and playing music in groups in context of performance with the help of Dave Sheridan, Pádraig McGovern and Catherine McEvoy. The students will record their final group performance and leave with a CD of their recording. The annual John McKenna flute and tin whistle competitions take place in the community centre at 2pm. Also on Saturday in Forde’s Inn at 3pm there will be a Youth Session led by John Kelleher and friends. The annual singing session with Jim Bainbridge and Jackie Boyce will include special guest Fiona and Jim Byrne from Ardra - A real treat in Davitt’s Pub at 5pm! Also at 5pm there will be a session of music held in the cottage at the community centre hosted by Michael O’Brien, a great opportunity to experience the playing and listening of music in a traditional atmosphere. There is a music session pub trail throughout the weekend. Further enquiries from 086 8569900 or info@johnmckenna.ie. Garadice members, John McCartin, Pádraig McGovern, Dave Sheridan, along with vocalist Eleanor Shanley.